Born in the city of Stagira, Chalcidice, Aristotle was the student of Plato and a classical Greek philosopher and scientist. His father, Nicomachus, was a physician at the court of King Amyntus III of Macedonia and his mother too was a member of the traditional medical units. He lost both his parents at a very tender age and was brought up under the guidance of Proxenus of Athens, and at the age of seventeen he enrolled himself in Plato’s Academy and remained there for the next two decades until he was thirty-seven years old. Aristotle was influenced by Parmenides, Socrates, Plato, Heraclitus, and Democritus. His writings constituted the first aspects of Western philosophy including subjects like biology, physics, zoology, logic, metaphysics, ethics, poetry, aesthetics, theater, rhetoric, psychology, politics, linguistics and government. In the west, he was known as ‘the philosopher’ and was Plato’s most sincere and beloved student. After the death of Plato, his nephew Speusippus took over his academy and Aristotle left Athens due to political deflects and grudges against the academy. He married Pythias and had a daughter with her by the same name as he was doing his research on marine biology. After his the death of his wife, he shared a relationship with his slave, Herpyllis who bore him a son Nicomachus. He also tutored Alexander the great in 342 B.C which opened gates for many resources and opportunities. He returned to Athens in 335 B.C. and started his own school, the Lyceum, which became one of the student attractions as it contained a collection of manuscripts and was later recognized to be one of the greatest libraries of the world and where he spent the rest of his life teaching, studying, researching and writing. Aristotle formed a set of courses of which, surveillance of writing of other great scholars was one of the main feature included as the part of the philosophical process. Aristotle framed his greatest and best works in Lyceum. He made lasting contributions in every outlook of human knowledge through books and essays. Aristotle wrote roughly around 200 works on papyrus scrolls out of which only 31 survive today. Some of his works that are still existing are divided into four groups namely, Organon th at is a logical analysis provided for any sort of scientific or philosophical investigation; Physics and Metaphysics, in which Physics surrounds itself with questions of matter and change and Metaphysics is the branch of philosophy that deals with existence, time, space, etc; Nicomachean Ethics and Politics deals with the nature of human beings that thrive on a single human or family or their social status; and Rhetoric and poetics where Aristotle offers a brighter account of single emotions that educates us about the perceptive characteristics of language and style. His other individual noteworthy ideas include Constitution of Athens, Golden Meaning, Aristotelian Logic, Syllogism, Problem of Future Contingents, Hexis, Hylomorphism, the theory of the soul which has made an effective impact on all the successive western philosophy, like, Christian philosophy, Islamic and Jewish Philosophies. He also wrote many graceful dialogues and treatises. Aristotle had to flee Athens in 323 B.C. again, after the death of Alexander the great due to political deflects. He died in 322 B.C. at the age of 62 in Euboea, Greece of Macedonian Empire after which favorite student took over Lyceum which further had a downfall due to other competitive institutions. 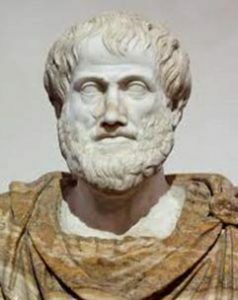 Aristotle’s works were lost and forgotten for many generations and later discovered in the first century B.C. in a musty crypt in Asia Minor. Aristotle was one of the most influential figures of Western history. His interpretation of things was more based on facts learned from experience one would gain in their lives, an approach that was different from that of his teacher who preferred a perspective that was beyond the reach of physical senses. He was an imaginative writer and a polymath, who wrote about various concepts and arguments in almost every area of knowledge.